Berkley Fusion Weighted Swimbait Hooks are targeted to everyone, from the novice to the avid angler. The Weighted Swimbait hook keeps all your swimbaits secure and running straight. Each hook features a weight and center pin attachment to hold your bait on better. Berkley Fusions are a hook combination, or fuse, a revolutionary slickest coating to ultra high carbon steel for fast, easier hook sets. 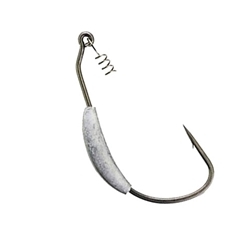 The hook points are sticky-sharp giving even novice anglers the ability to set hooks like a pro.